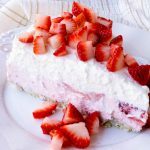 This Luscious, Creamy, No- Bake Fresh Strawberry Cream Pie is Keto, Gluten Free, Grain Free, low carb and even nut free too! 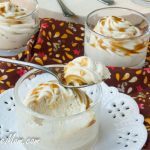 No Bake ecipes are the joy of the spring and summer season for me. Fresh strawberries are in season and I love to use them when they are nice and ripe. You could certainly use another low carb berry of choice like raspberry, but my family loves strawberry. If you’re into Blueberry I’ve got this awesome No Bake Blueberry Cream Pie! Life a little easier when no oven time is needed and you just want to put together a pretty dessert for company or to take to a party. This pie is everything you want in a dessert. 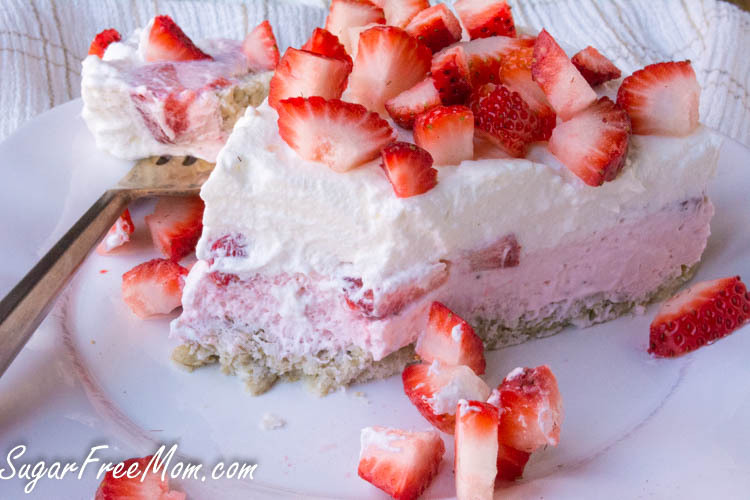 It’s mouthwatering layers of crunchy crust, smooth sweet mousse, perfectly ripe strawberries and sweet sugar free vanilla whipped cream, make it one of those recipes your family will ask you to make over and over again. 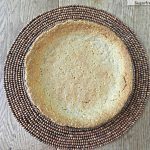 I make many of my recipes nut free using coconut flour or sesame and even sunflower since my youngest is allergic to tree nuts. You can definitely replace the sunflower seeds in the crust with a nut if you prefer. The strawberries on top are not included in the nutritional info below as I went a little heavy on them for the pics and this would increase your carb content. Just a few will do for decoration when serving. 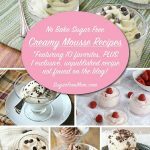 As long as you have a few kitchen appliances like a food processor or chopper of some sort and a KitchenAid mixer or handheld mixer, this recipe comes together quickly. 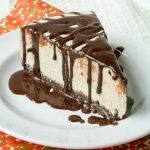 Did you know you can even make desserts in your slow cooker? I love doing that in the summer and have this yummy Blueberry Custard Cake you might love! I love to WOW my friends and family when I make a pie like this and everyone is shocked when they taste it because they just can’t believe it’s made without sugar, low in carbs, and nut free too! Love Strawberries? You might also like my No Bake Strawberry Cheesecake Dip or something savory like my Strawberry Salsa Shrimp Lettuce Cups. This recipe was first published in May 2016 and updated with a video in July 2018. Place all crust ingredients into a food processor and pulse until they are the consistency of fine crumbs. Grease a 10-inch springform pan. Spread crust ingredients onto the bottom of the pan. Place the water into a small saucepan and sprinkle the gelatin over it. Heat on low, stirring constantly until the gelatin completely dissolves. Allow to cool. Place all the remaining filling ingredients, except heavy cream, into the food processor and process until smooth. Remove and place this filling mixture into a stand mixer and add heavy cream. Combine, on high, until mixture is whipped. Slowly blend in the cooled gelatin for another minute. Spread this mixture onto the crust. 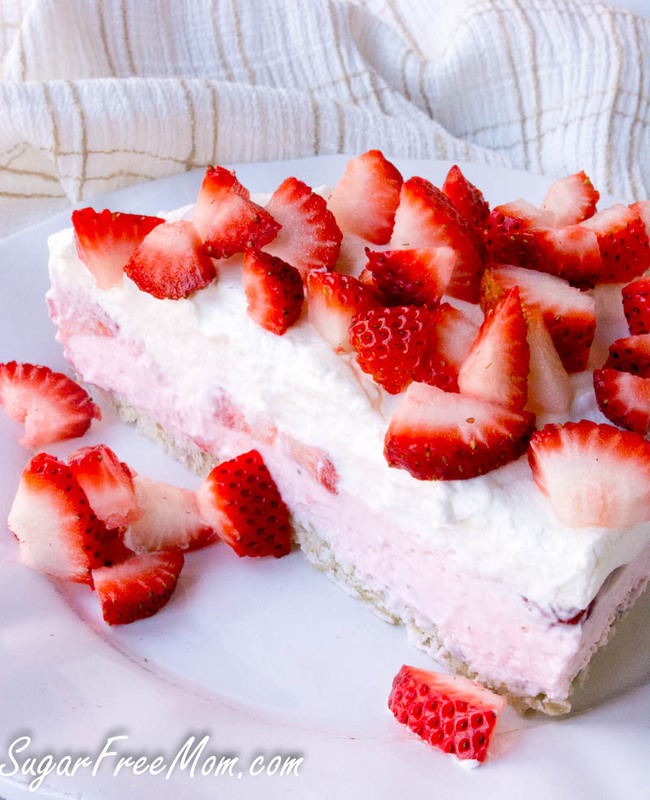 Lay sliced strawberries over the filling. For the topping, pour the heavy cream into a stand mixer with Vanilla Crème Sweet Drops and blend until whipped. Taste and adjust Sweet Drops as needed. Smooth this over the strawberries. Refrigerate for 2 – 3 hours or overnight. I can definitely see why people would ask for this over and over again! Oh, and I love the video! The video says 1/4 cup butter, but you add a whole stick, which is 1/2 cup. How much butter should we use? I actually made a mistake in the video and it should have been just 1/4 cup so the recipe is correct, sorry about that. Although the crust comes out great with either amount really. Do you have a sub for the coconut in the crust, or would it turn out ok if omitted? I have a coconut allergy unfortunately . You could replace it with almond flour or more sunflower seeds and add some pumpkin seeds. FULL RECIPE PLEASE!!!! GELATIN? ? 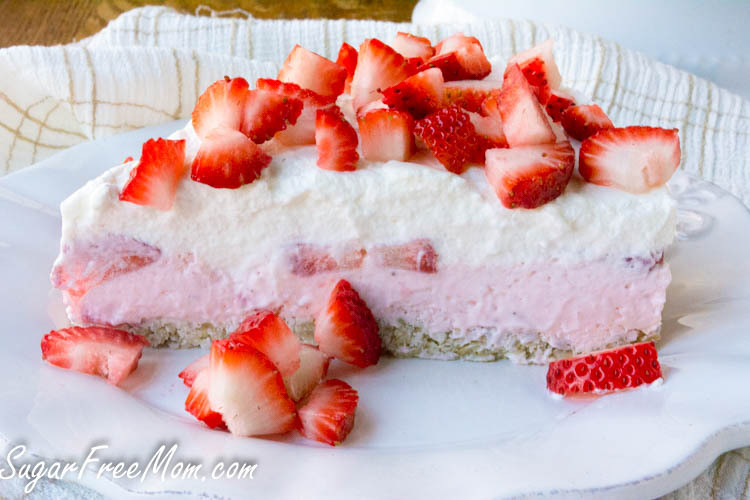 We love strawberries and no bake desserts are the best for the summer! Love this pie! I’d request this again and again, too! It looks absolutely dreamy. 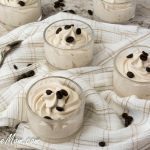 I’m all about no-bake desserts at the moment so this is right up my alley! This looks incredible! And no added sugar? Sign me up!! I am so, SO glad it’s coming into strawberry season. This pie looks glorious! Can any nuts be substituted? I believe you could sub any nut you like for the sunflower seeds. 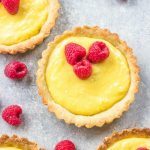 I can see why this creamy, dreamy pie is such a hit! 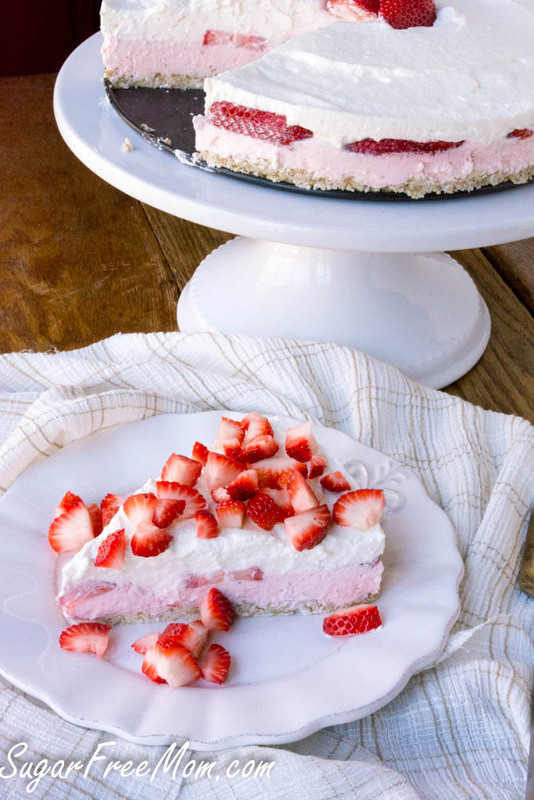 No bake pies are a rite of summer. Love them! Extra strawberries for my slice, please. I love practically anything with strawberries and this looks so refreshing, yummy! Love to make this lovely pie, but I need the recipe to copy. Thanks, Jacquie. This strawberry mousse looks delicious I am going to try this soon. You totally had me at no-bake. 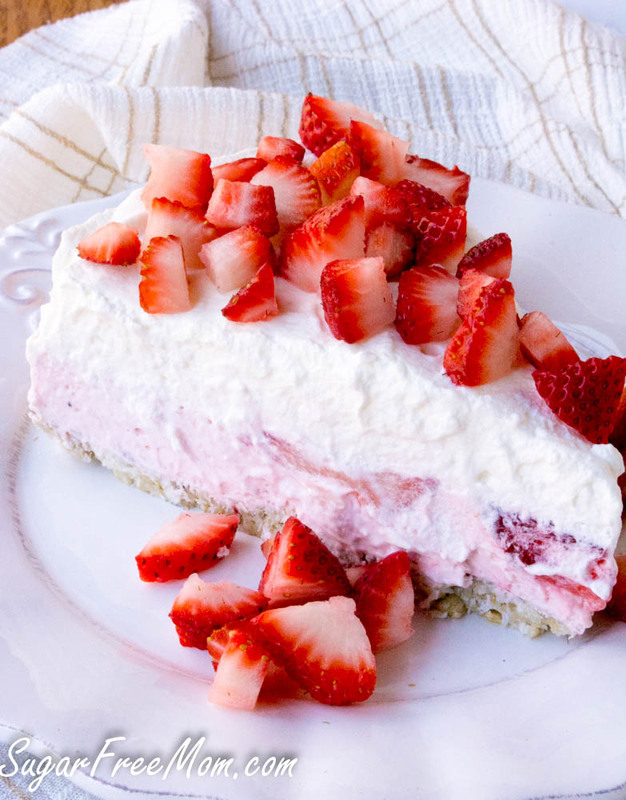 With strawberry in season, I’ll definitely be making this pie very soon!! 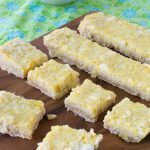 I’m all about no-bake desserts for the spring and summer! Especially when those desserts contain strawberries! Use unflavored gelatin or strawberry? It looks like unflavored. Dissolve in how much water? Just til dissolved or 1C? Thanks for posting. Going to make this today! It was unflavored gelatin and I dissolved it in 2 tbsp of water. Is the unflavored gelatin Knox, in the orange box? I’ve never used it! Always been afraid to give it a try. But this looks so delicious! Thanks for the update on the video. I was thinking you added 1/2 cup butter. Thank you! I just discovered SweetLeaf…I love it! yes the orange box is all you need, unflavored, then open packet and measure some out. Thanks! do you have the nutrition breakdown for this recipe? thanks! It’s on the website where the recipe is posted. where the link to print this recipe? The recipe is posted on the Sweetleaf website. Perhaps leave them a comment and ask there. I’m always talking about people who are always switching ingredients around and not going by recipe, but here I go. Could I use almond flour in place of sunflower seeds and if so, how much? Then could I use strawberry jello instead of the unflavored? I don’t have any of the unflavored and have never used it. Do you think the strawberry jello would make it too overpowering? I appreciate any feedback on this. Thank you! I think almond flour would be fine to sub the sunflower seeds with and same amount. I don’t know that strawberry jello would be the same, I’m using the unflavored gelatin to make the mousse more set, not sure how jello would work to do that. Sorry! Thank you for your reply. I will just have to think a little more on the jello question. May just have to take a chance and try the unflavored stuff. Thanks again. 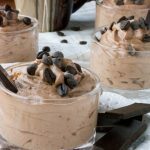 Hello, I’m new to your website, I was wondering if the no bake cheesecake can be made in muffin cups and can they be frozen. Thanks. Sounds like a great idea. I’ve not frozen this but I think it would be ok.
Did you calculate the nutritional value of this pie? 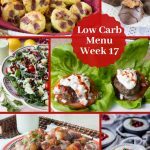 I’m eating LCHF KETO and need to know net carbs please. Thanx! I can not find the actual recipe or the carb count. I made it today by watching the video and writing it down, but I missed the gelatin and the 1/2 of cream altogether. Hopefully, it still tastes okay without it. It looks good! The link to the recipe is directly under the video. It takes you where the recipe is posted with all the ingredients and nutrition information. Sweetness is from stevia would dry sweetener like Splenda and how much dry measures to the wet? Is the crust cooked? It sounds strange if you substitute almond flour for it to be raw. Thanks. I guess you could certainly cook the crust if you’re subbing almond flour but you could keep it no bake by just subbing in some raw almonds instead of using flour. You’ll have a great nutty crust. Where is the video please? 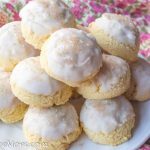 This recipe isn’t sugar free, you still use Stevia, which is still technically sugar. Incorrect. Stevia is not technically sugar. It is a natural plant, completely sugar free, doesn’t spike blood sugar and is not artificial. No relation to sugar in the least. The leaves are boiled down to produce the liquid stevia. Please do some research. How long would this keep in the fridge, please? Also, have you ever tried freezing it? I was thinking of making individual portions so I can save some for later, rather than keeping the whole dessert in my fridge. Thanks! hey Brenda, my name is Trevor I’ve been working on learning how to bake , with my sister just , want to say thankyou for all your recipes this one was a real hit. This looks amazing! My daughter loves strawberries. Can I replace the Stevia liquid with Erythritol? Of course, use whatever sweetener you like. I’d say if you have the Swerve confectioners to use that as any granulated sweetener will make this gritty not smooth.